Recently some friends introduced me to a place that has edged out McD's as my favourite Western breakfast out. The Chinese name I am not sure how even to begin translating - Butterfly Fragment Music Coffee? The English name couldn't be simpler - Coffee. Below, their latte. (Appearance great, flavour OK.) The macchiatos came with lovely treble clefs drawn in caramel on top. The brunch deal runs from 9:30 t0 12:30 - espresso or latte plus two fried eggs, two strips of bacon, sliced fruit, a little coleslaw on a crouton, and cookies for Y20. This is a deal and a half - the drink by itself would be Y27. They also do lunch, steak dinner, and dessert after 10 specials. One or two of the servers speak some English and they have picture menus. Address: 青羊区通惠门路3号锦都3号院 (Behind the 通惠门 人人乐) There are a few other branches in town and one in Kunming; look for locations here (Website all Chinese). This is an area just northeast of downtown with temples, lots of shopping, art performances, food stands, and during the holidays carnival booths. On the food streets there is a constant boom, boom of 三大炮 being made. This stand is serving the great 羊肉泡馍 (yangroupaomo - lamb soup with bread soaked into it) from Xian and thereabouts. Love it, but didn't try it for a couple of reasons: 1) Have never eaten a good version in Chengdu. 2) The bones in the top of the cage were nearly raw, though had hot broth poured over them constantly...looked like a recipe for an upset stomach. Deep fried crabs, with hot pepper and cumin. 热凉粉 - Hot cool pea starch. It's called hot/cool because this is usually served cool (凉粉), but this is a hot version. Make sense? The toppings are the usual - soy sauce, vinegar, msg, hot pepper, Sichuan pepper, green onions. 艾蒿饼 - Artemisia cake. Vendor says they are made from flour and millet flour and a wild plant. Crispy on the outside, soft on the inside. 春圈 (or 春卷? chunjuar, anyhow) - Spring rolls. I've never seen the fried kind of spring roll here unless you go into a Taiwanese place. This is a combo plate of spring rolls, with different wrappers - thin crepes (probably from millet flour), rice noodles skin, and doufupi (tofu skin). In the middle are shredded carrots, what I think are lettuce hearts, and cucumber. This hilarious map appears on a Chinese message board, and is titled Map of China Through Sichuanese Eyes. Each region is labeled according to food. 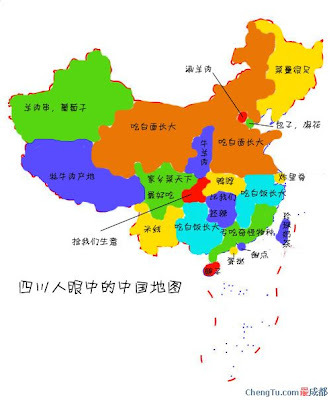 Big swaths of northern China are labeled - 'Eat plain flour based food', big swaths of the South are 'eat plain rice'. Sichuan itself is 'Best Local Food in the World'. 豆花 (Dou Hua, or Flower Tofu) comes in both high and low end versions. This snack restaurant has the mid range, with little bowls of soft tender tofu in a starchy sauce and all kinds of great things on top. Below is 馓子豆花, san zi dou hua - the crumbles on top are 'san zi'. The 牛肉豆花 (beef dou hua) is great as well. Bagged potato chips in China are a little strange. They are nearly always sweet and many flavours, even the plain ones, oddly include chicken. The main brands manage to keep a bit of chemically preserved freshness and crunch, but others taste like they've been made from sawdust. The snack known as 香辣土豆片 (fragrant spicy potato slices) is great in theory but the chips are often scooped on the street out of industrial sized bags and, well...potato chips don't benefit from long exposure to the local humidity. Discovering this market stall, which makes 香辣土豆片 fresh in small batches, was like finding treasure. The chips are very like what are sold as kettle chips back in Canada - thick, salty, spicy, more crunchy than crispy, and carrying a sheen of oil. This is the place: 哈尔宾 烤饼馆 - Harbin Baked Goods Shop, in the Yulin Market. The address (shown also on sign below) is 玉林西街 12 号.
Tripe noodles (肥肠粉) are a favourite local snack - spicy and sour, with tender rice noodles and chunks of tripe. It's very cool to watch if you happen to come by when the noodles are being made. Bai Jia Gao Ji Tripe Noodles has a few locations but this one is easiest to find, on the 4th south section of the first ring. The wallboard menus describe no less than thirteen different preparations of tripe - dry-fried, stewed, twice-cooked, steamed - what, no gong bao tripe ding? There are also several other types of noodles and 盖浇饭 (stuff over rice) plates. I ducked in on a cold rainy afternon and passed up the house specialty for twice cooked pork over rice and a bowl of 素菜汤 (vegetable soup). Vegetable soup is extremely simple - more of a drink than a dish; sometimes not much more than hot water with lettuce. Vegetable soup is one of the main ways I judge a new place. From the soup you can tell how carefully they shop for and prep vegetables, and any grit in the bowl will tell you how clean the kitchen is. Vegetable soup is also always the cheapest thing on the menu. This version is one of the more unusual - bean sprouts in what is unmistakably tripe broth. It tasted great but there was quite a bit of detritus on the bottom.